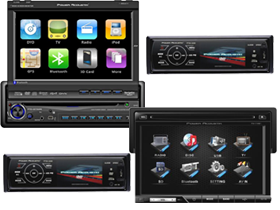 In-Dash Car Radios are fast becoming the standard for Car Audio Entertainment. features MP3 or DVD playback, Bluetooth, iPod Support, Touchscreens, and GPS Nav Ready. HalfPriceCarAudio.com loves Power Acoustik because of the sleek, modern, easy to navigate and tons of features which helps give your car audio the edge that your looking for.